Detroit provides a case study of municipal finances gone awry. As the domestic auto industry declined and suburbs grew after World War II, Detroit lost almost two-thirds of its population and much of its tax base, but did not cut spending proportionately. Detroit faced daunting impediments similar to other American cities—unfunded pension liabilities, urban blight, decaying infrastructure, poor services and high rates of poverty and unemployment—but the problems were especially severe in the motor city. After halting efforts at reform, the state of Michigan put Detroit under the control of a state-appointed emergency manager who filed for bankruptcy in July 2013 (the largest municipal bankruptcy in U.S. history) to address total liabilities estimated at $18 billion. In November 2014, Detroit emerged from bankruptcy after creditors agreed to reduce the city’s pension and other liabilities by $7 billion. Detroit’s Mayor and City Council regained power and have since balanced the budget for two consecutive years while rebuilding some city services and revitalizing downtown. Jason Juffras spoke with Detroit chief financial officer (CFO) John Hill to learn about Detroit’s financial crisis and nascent recovery. Mr. Hill also played a major role in Washington, D.C.’s fiscal recovery as executive director of the president-appointed D.C. financial control board from 1995 to 1999. This is the first of two articles summarizing the interview with Mr. Hill. On his roles and responsibilities since arriving in Detroit four years ago: I first came to Detroit under contract with the emergency manager to help improve the grants management system. After the CFO left, the emergency manager asked me to be CFO. My role during the bankruptcy was to testify on the plan of adjustment and stabilize our financial operations. After bankruptcy, restructuring the CFO office was a major activity. I revamped all of the positions, and hired everyone into all of the new positions. We did not give current employees any status over anyone else, but we did provide employees with training on how to interview and apply for new positions, as well as opportunities to enhance their skills. Many of them successfully transitioned to the new organization. In retrospect, I would have started earlier on upgrading the financial management system and the systems that support it — we started the day before we got out from bankruptcy. On the similarities and differences between D.C.’s fiscal crisis of the 1990s and Detroit’s fiscal crisis of the 2010s: One of the differences is that Congress acted fairly quickly—it was kind of breathtaking—to create the control board. By contrast, Detroit’s situation had been 30 or 40 years in the making. Detroit’s population was 1.8 million in 1950, and had fallen to 700,000. One of the other big differences is that Detroit has three times the land mass of D.C. Most of Detroit’s population lives in single-family houses, and the drop in population left behind a lot of blight. Detroit was a poorer city, and transportation infrastructure was lacking. On the similarities and differences between the financial recovery steps in D.C. and Detroit (besides the formal bankruptcy process in Detroit): In D.C., certain functions were taken over by the feds – prisons, for example. Over time that has created a tremendous advantage for the District. Economic development also kicked in quicker than it did in Detroit. Some expenses were pushed back in Detroit in the expectation that revenues would be higher by the time the expenses need to be paid. By 2024 and 2025, the city must meet a much higher cost for pensions and debt. We are now working on these cliffs — we felt we just couldn’t delay until 2024. We’re looking at ways to restructure our long-term debt to take care of the cliff. I have never seen another city where they looked 10 years out to try to reshape the financial future now. 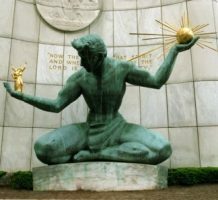 City monument entitled, “Sprit of Detroit,” dedicated in 1958, by Marshall Fredericks. On the “grand bargain,” which involved contributions of more than $800 million by the state and private foundations to prevent the sale of assets from the city-owned Detroit Institute of Arts: Without the grand bargain, we would have had to sell off some of the art, or we would have had to substantially reduce the amount going to pensions in the future. The money from the state goes directly into the pension fund. So far it’s been working really well. The city is making all its payments to the pension plan. The second article on the interview with Mr. Hill, to be published next month, will discuss balancing the needs for austerity and improvements in city services, how city leaders can avoid a fiscal crisis, and how Detroit leaders are trying to sustain the city’s progress.